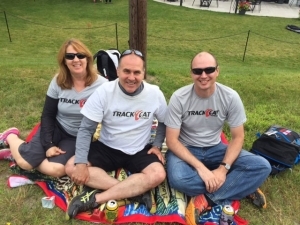 Ironman Lake Placid is elusive, exciting and challenging! 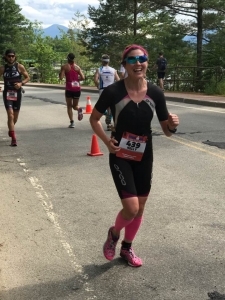 I went into Ironman Lake Placid the fittest and fastest I have ever been in all disciplines but still nervous about Keene. Super pumped to have the race of my life, I knew I was capable of a sub-11 and meeting the challenge of the storied 30 minute fast downhill. Of course, Ironman doles out a lot of lessons. I didn’t get under 11 but I also raced strong in many areas and learned a lot. The swim in Mirror Lake is as glassy as they say with a cable to sight off the entire time. The cable is…. (I bet you are thinking I’ll say amazing, a gift, a joy)… overrated. It hadn’t occurred to me that the cable impact would slow me down. I am confident in open water and an efficient sighter so it didn’t eliminate problems for me that others have. Tactically, I was weak. I lined up way too far back in the rolling start though as I got stuck in congestion and no one nearby seemed to be my pace. Rather than simply moving over to the left and swimming around others confident in my finely honed open water skills, I held my position ON the cable with stubborn determination instead even though the congestion was thick and pace below my capabilities. Beaten to heck and frustrated I exited lap 1 and did not change my bad strategy for round 2 of even more congestion. I was even more hell bent on staying on the cable. Just because I am unphased by aggressive swim crowds does not mean that hanging in the congestion is the tactically optimal choice. I came out in 1:14 and was not pleased because I know I can do better. I should add this to our 100 swim tips! EFFICIENT & EFFECTIVE! As always. The bike was amazing. I am most proud of this! My heart rate was the lowest it has ever been coming out of the water. This is a combination on my improved swim technique and going lighter on the swim than normal. I climbed up out of town and was preparing my mind in nervous anticipation for the descent. Nailing that 30 minute or so section of constant controlled and skilled FAST descending with assertiveness and focus would equate a successful day…and prove to myself that I AM a strong cyclist. That ride went down in aero tuck with me pedaling for MORE speed and trusting the carbon fiber extension of myself to swoop and flow down the mountain. CRUSHED IT! I have MADE it as a triathlete cyclist! My body knew how to execute well and my mind was focused yet full of joy. Even in the middle of the descent when I felt the only rain of the day pelting at my skin sharply I was in control. I know when it COUNTS I know I can do this! The power meter worked great! I was a little under goal normalized power and HR was low but I figured I’d crush lap 2. The 3 Bears felt like nothing compared to the VT mountains. I was high on the Ironman vibe… then…Lap 2. If I overcome and face my fears I can find joy! In discouraging congestion of lap 2, I just did not ride to my potential. Braking was the theme for Keene part 2 because I did not want to cross the double yellow line to move around the little clusters of conservative pacing athletes. I was aggravated. On to the flats my obsession with keeping it “fair” led me to fall way back after being passed or to hold way back when approaching draft groups to stay out of the mess. I know I do not have the energy to pass ALL of them when they surge and block. Winding up in a bad spot nevertheless my first ever 5 minute time out draft penalty was here. I was trying to get through a peloton of men in matching kits that were obviously all working together. I had been yelling at them and burning watts but they wouldn’t make any passes stick. I have heard of this happening to plenty of women I respect deeply but it still crushed me. The men in matching kits clearly working together as a team didn’t get any penalties. That upset me even more! I took it as a personal character attack in the moment…. but that is not what it is! I spiraled out of control as I began trying to cheer myself up by thinking about how there are far worse injustices than this…”real” problems. This tactic did not work well at all. What a downer! I was not present anymore. The bike was over in 6:00:42. My next Ironman I will endeavor to stay present and have the memory of a goldfish! Focus on what I can control is all I can do. At my level, steady state the whole way through isn’t possible if I want to get around “the idiots.” Surge over threshold and recover is what I need to do next time. I under-biked again so can clearly afford a little surging. Being risk averse and able to hold low watts on climbs, I am likely not the kind of athlete that is prone to “over-biking.” I got a penalty despite my best/cautious efforts so I might as well just get after it and learn to take a more calculated risk to SURGE past slower groups that I approach. 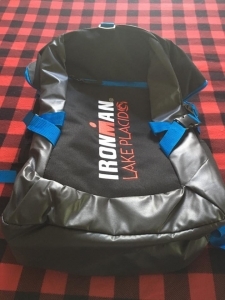 With out a penalty one could say that my Ironman Lake Placid bike would have been 5:55:42….BUT probably faster if I had not been an idiot, fallen apart and mentally checked myself out of the 2nd loop of the bike. I struggled to find my bag for some reason but otherwise it was quick and easy. Always nail transitions. Rallied and smiling again! Photo credit to Carol! I love this run course. It is a nearly identical route to the Lake Placid Half Marathon where I had come seconds shy of an overall podium and won my AG in a confidence boosting 7:24 pace the day after riding a century on the Placid course. Preparations and confidence pre-race were spot on. My head was still not right in this race though. My pace was off. I couldn’t “make” myself do it. 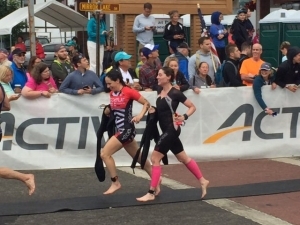 I believe being off target was mental…not physiological as I was able to rally and run in the last section. It is rare to admit this…but I do not mind being candid. This is not the glossy part of the sport but most face it at some point whether they admit it or defer blame. Owning up means I can improve resilience and get better! The good news is that “resilience” is fix-able. It is not mysterious. I am so aggravated with myself about this…that next time I will fight more. I will remember Ironman Lake Placid. Dubious about my ability to run through the fatigue in the moments, I rallied and got a respectable finish time! This is a lesson! This finish is in the Olympic Oval! I almost ran a 3rd lap but Nick saw me veering and hollered for me to finish! Ironman finishes never get old! A guy ahead of me was being egged on by buddies and then they chanted at ME to pass their friend. I had plenty of energy in my legs so I went after it and we both sprinted in a really neat moment of excitement. Lessons: Things can turn around! Believe and keep going. I love the Ironman. I have the best support team ever! They are a part of these finishes as much as I am. Camp was the very next week which was awesome! Next Stop…Ironman 70.3 World Championship in September! Check out our Race Planning Tool just added to the site…I will use the lessons from this race as I prep for Worlds! Neat Lap Top Bag comes with registration!